BUYSOUNDTRAX Records presents the original soundtrack to DUMBSTRUCK, featuring music composed by Daniel Licht (DEXTER, BODY OF PROOF, HELLRAISER: BLOODLINE, BAD MOON) for the 2010 documentary about ventriloquists directed by Mark Goffman (WHITE COLLAR, THE BEAST, STUDIO 60 ON THE SUNSET STRIP). DUMBSTRUCK takes viewers to Ft. Mitchell, Kentucky, the ventriloquism capital of the world, to attend the annual Vent Haven Convention, the world’s oldest and largest gathering ventriloquism gathering. For over thirty years, the art of ventriloquism has been celebrated at this festival, where professional ventriloquists from all over the world come to expand the art and keep it alive and well by teaching it to those who are interested in learning about it or looking for ways to improve their skills. DUMBSTRUCK focuses on five different performers who attend the convention and follows them as they pursue their ultimate goal of becoming a professional ventriloquist. The music for DUMBSTRUCK is composed by Daniel Licht. Upon graduating from Hampshire College in Massachusetts, where he studied composition, jazz, and world music, Daniel Licht moved to New York City and established himself as a musical artist in the Lower East Side creative music scene. Using New York as a base, he traveled to Germany, Holland and Northern Europe, performing and composing music for theatre and dance companies. His studies took him the other direction around the globe traveling to Japan and Indonesia, where he studied the music of the gamelan orchestra on the islands of Java and Bali. In New York City, he could be seen playing jazz with Don Cherry, Jaki Byard, and David Amram or performing new music for the gamelan orchestra (indonesian traditional instruments) with Barbara Benary’s group “Gamelan: Son of Lion”. Daniel Licht also wasted no time in establishing himself as one of New York’s hottest and most eclectic advertising composers, scoring for such unlikely clients as Mercedes Benz, Sony, and AT&T. Licht’s eclectic musical tastes and knack for delivering the appropriate cue made his transition to film scoring inevitable. At the prodding of his friend and ex-classmate Christopher Young, he closed up shop and moved to Los Angeles in the early 1990s to pursue a career in scoring films. Daniel has written music for films such as CHILDREN OF THE NIGHT, CHILDREN OF THE CORN II: THE FINAL SACRIFICE, HELLRAISER: BLOODLINE, Stephen King’s THINNER, BAD MOON, PERMANENT MIDNIGHT, SPLENDOR, SOUL SURVIVORS and music for television shows such as JAKE IN PROGRESS, CASHMERE MAFIA and KITCHEN CONFIDENTIAL. He is currently in his sixth year scoring the popular television series DEXTER and is also providing music for BODY OF PROOF, now entering its second season. Daniel has also written his first video game score for the next entry in the SILENT HILL series, DOWNPOUR. 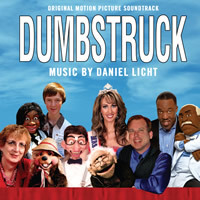 BUYSOUNDTRAX Records presents the original motion picture soundtrack to DUMBSTRUCK, featuring music composed by Daniel Licht. DUMBSTRUCK is a limited edition of 1000 units. The first 100 copies sold through our website will be autographed by the composer. Order the soundtrack to DUMBSTRUCK and get THE GREATEST MIRACLE soundtrack at special sale price of $12.95 (reg. $15.95). THE GREATEST MIRACLE at the sale price. Offer Good thru Oct 10, 2011.